We are glad that you are searching for information about our Club, or perhaps you are hunting for a model railroad club located in Brevard County. Well, you have come to the right place. We are a club devoted to Model Railroading and the promotion of the hobby. All ages are welcome. Youth under the age of 18 must be sponsored by an adult. Our club house is located in the Gibson Complex near Titusville High School in Titusville, Florida. Our meetings take place every Monday evening from 7:00 PM until 9:00 PM at the Club House. Titusville Area Model Railroad Club (TAMRRC) was incorporated in September 2003. Nestled behind the Titusville High School and near the railroad tracks, our Club has three operating layouts. The "HO" Gauge layout was initially 9 modules hanging on racks in an area train (hobby) store before being donated to The Club. The 9 modules were fitted together and additional curves were added as well as a triangular piece in the center. The layout has undergone revisions over the years but has had a major renovation in 2015, which include the addition of a salvage yard and a new street in town...bustling with shops and service providers. We are able to operate both DC and DCC trains simultaneously and there are three distinct loops. We use the NCE Power Cab controlling system for DCC. 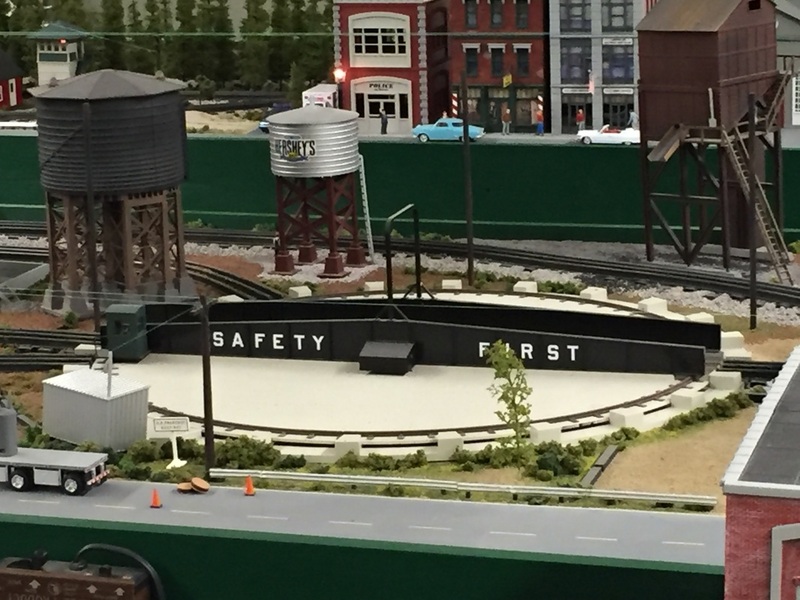 The "O" Gauge layout was built from scratch. This 15x15 layout has undergone track improvements in 2015 to replace the right-of-ways with GarGraves track. New buildings have been added to our "O" Gauge city and the train station was recently relocated to the center of the city. As part of the extensive 2015 renovations, new turnouts replace older (manual) turnouts and the layout was recently rewired to allow two working loops to operate simultaneously without any issues. We are able to operate both DC and DCS trains on this layout. There is a peninsula in the center with a working roundtable. The "N" Gauge layout was also built from scratch. This layout hasn't undergone the same renovations as the other two, but it was recently raised up and put on wheels to allow mobility. There are two operating loops and plans to tackle rewiring of the layout in 2016. While we currently don't have a specific "Open House" event during the year, we encourage you to visit us any Monday night between 7:00 PM and 9:00 PM. There are "Club-owned" trains that you can run...or...you can bring your own to run! Our membership is also well-represented at many of the area train shows.